Campaigners for a safe crossing in Budapest painted part of a zebra near a road in a bid to get their message across to authorities. They drew the animal’s head and tail either side of the street in an apparent attempt to get the safety measure added. It is thought Hungary’s satirical Two-Tailed Dog party were behind the stunt. The party claims a zebra crossing is necessary because 5,000 people walk over this section of the road every day. 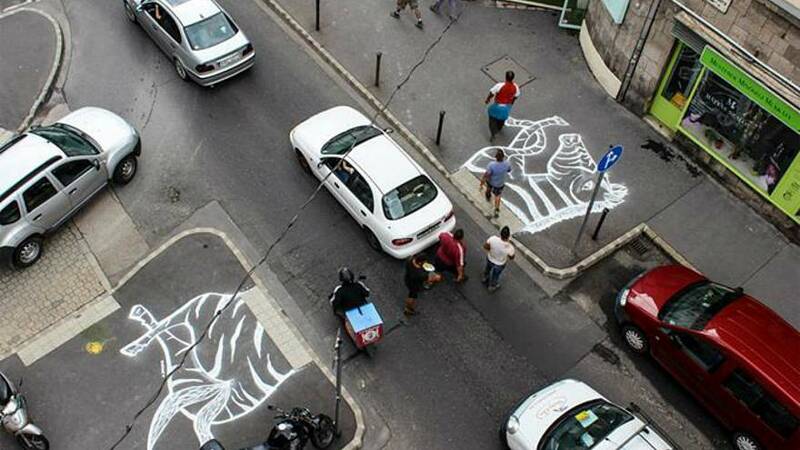 It published pictures of the zebra in July and authorities in Budapest have since removed the graffiti. Meanwhile police have written to the party demanding more information about the fictitious character Basky. Basky, which sounds like a Hungarian swear word with a similar spelling, is a jokey reference to the anonymous British street artist Banksy. The Centre for Budapest Transport told Euronews the zebra's head and tail was removed to avoid confusion for pedestrians. Vajon mit tesz a I. kerületi önkormányzat, ha jelzik neki, hogy kéne ide egy zebra, mert naponta 5000-en mennek át itt? Zebrát csinál? Ugyan.